Influencer marketing offers possibilities for businesses in virtually any niche. It’s grown out of celebrity endorsement, but, with nearly everybody now on social media, it turns out that relatively ordinary, down-to-earth people are often the best influencers. To be of use to you, an influencer’s following must match your target audience. You might be tempted to try to work with Justin Bieber and his tens of thousands of followers; even if you ignore the difficulty of gaining access to him and paying what would undoubtedly be a very high price (he’s unlikely to work with you for free unless he personally adores and uses your product), his followers will be of little use to you unless your product targets his following of teenage girls. So, how do you find suitable influencers? There are now various ways, ranging from using the various social media channels themselves to paying for specialist networking tools and working with influencer marketing platforms that can provide dedicated influencer search engines. Here are six tools and approaches you can use to find influencers who are right for what you have in mind for your marketing. 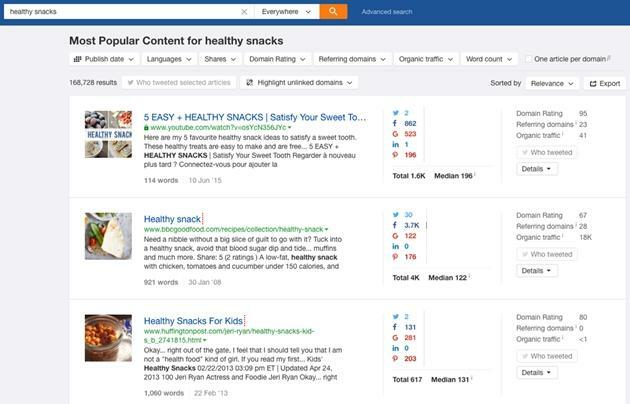 BuzzSumo is an online tool that helps you determine which content works well regarding any topic. You can even use it to see what has worked well for your competitors. 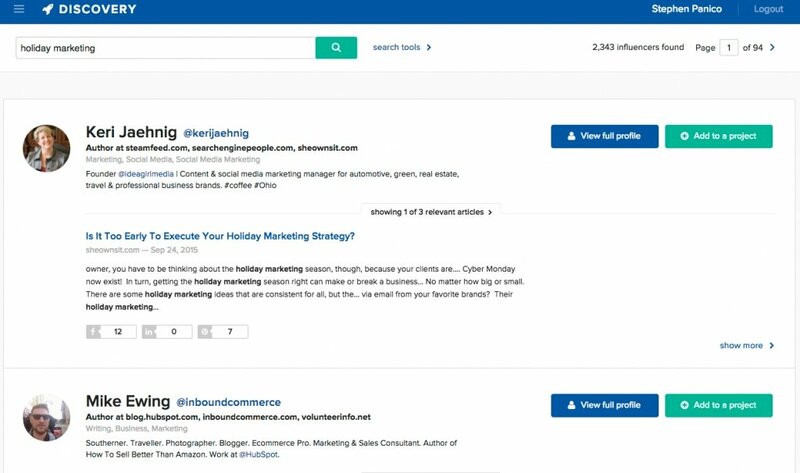 BuzzSumo also has an Influencers and Outreach section to help you find, analyze, and follow influencers. 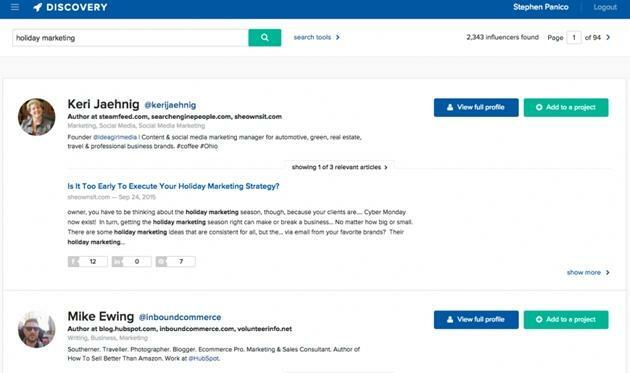 Select your topic, and BuzzSumo will suggest a list of influencers in your niche. You can opt to display this list by relevancy, page authority, domain authority, number of followers, retweet ratio, reply ratio, and average retweets. Again, number of followers should not be your primary focus. The other factors are equally important. Retweet ratio is particularly useful: It doesn’t matter how important a person is; that influencer will be of little benefit to you if he or she doesn’t share your content. Let’s say you’re searching in the leadership niche and want to know who is influential in it. Buzzsumo ranks Dan McCarthy (@greatleadership) as the most influential leadership blogger/influencer when you sort by relevancy. However, you would be far more likely to have your quality content shared by Michael McKinney (@leadershipnow), who has a retweet ratio of 12% compared with Dan McCarthy’s 1%. An alternative way to find influencers in BuzzSumo, if you have the Pro version, is to search for “Top Authors” in the “Content Analysis” section. You can do this search by topic or domain. For example, if you search for the top author on the topic of “leadership,” you see that the Harvard Biz Review has published 570 articles that have been shared 5,129 times, with 2,923,443 total shares. In this case, the highest-ranking author with a known Twitter account is Lolly Daskal (@lollydaskal), who has had 197 articles published, averaging 8,117 shares, totaling 1,599,125 shares. If you could convince her to share one of your posts, it could potentially be seen by a very large audience. One of the key purposes of Buzzstream is to build a list of influencers and nurture relationships with them. Once you have built up a list of relevant influencers, you can use Buzzstream to track your connections with them, recording your relationship status with any potential influencer at any moment in time. It is particularly easy to build up your contacts as you browse the Web. If you perform a Google search for a topic (for example, a search for “fitness blogs”), Buzzstream will create a “Filter Prospect List.” Once Buzzstream has created that list, you can use it to search for the contact details of anyone on the list. Buzzstream provides a huge amount of information about potential influencers, including their email addresses, physical addresses, and phone numbers (if publicly available). Buzzstream provides Moz’s Domain Authority, Moz Rank, and Page Rank for any websites you analyze. You can use those rankings to assist your influencer search. You might, for instance, narrow your hunt to people whose websites have a Domain Authority between 40 and 70, with at least 1,000 Twitter followers. Many websites use Moz to help them with their SEO. One of the Moz products is Chrome plugin MozBar, which shows a variety of SEO statistics for any webpage you visit, including Moz’s Domain Authority (DA) and Page Authority (PA) scores, as well relevant link metrics. Though some information is available for free, additional data is shown for those with a paid Moz subscription. The MozBar is useful when working out which sites have true authority. If you were looking for influential bloggers, for instance, you could go to their websites and the MozBar would show their level of Domain Authority. A blogger who has established an influence on Twitter but who hasn’t gained a similar level of following on his own blog may be of less use to you than a blogger with a high DA. Similarly, you can check the true influence of company websites by their Domain and Page Authorities. If you receive a backlink from a site with a high DA, it will have a far higher impact on your search engine rankings than a backlink from a site with low Domain Authority. A very important statistic on the MozBar is the Spam Score. Sites with high Spam Scores are clearly sites to avoid pushing for backlinks. Ahrefs also provides tools to help with a site’s SEO. It places particular emphasis on link research. 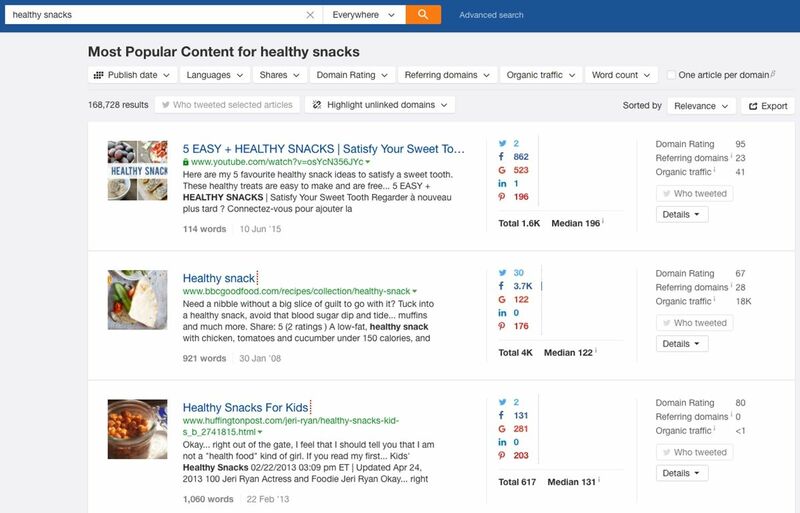 Ahrefs Content Explorer focuses on finding the most popular content on particular topics. Like Buzzsumo, it aims to provide you with the most popular articles on a topic, based on social shares and backlinks generated. You can dive deeper into an item of content to determine the way it gained its traffic and its social shares. Although that does not directly find influencers, it does show what the most popular websites are for a specific subject, and it can give you ideas for content themes that have previously interested people. 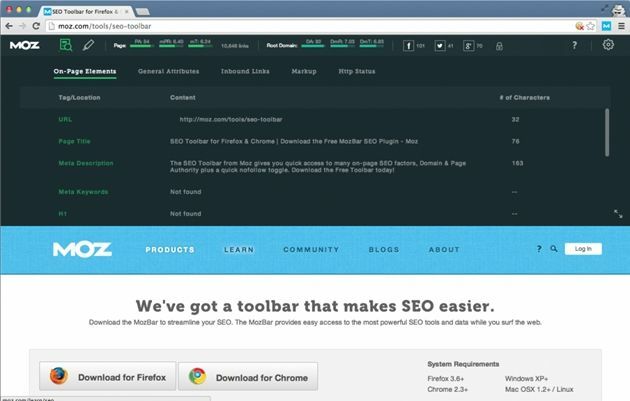 Ahrefs also has an SEO toolbar that provides information about the domain ranking for any website. As with MozBar, you can use the Ahrefs SEO toolbar to determine how relevant and influential a site is. If you are in the tech sector looking for some form of media coverage, you can find the contact details for journalists at Hey Press, a searchable database of tech journalists from various organizations, such as the Huffington Post, Tech Crunch, and The Guardian. 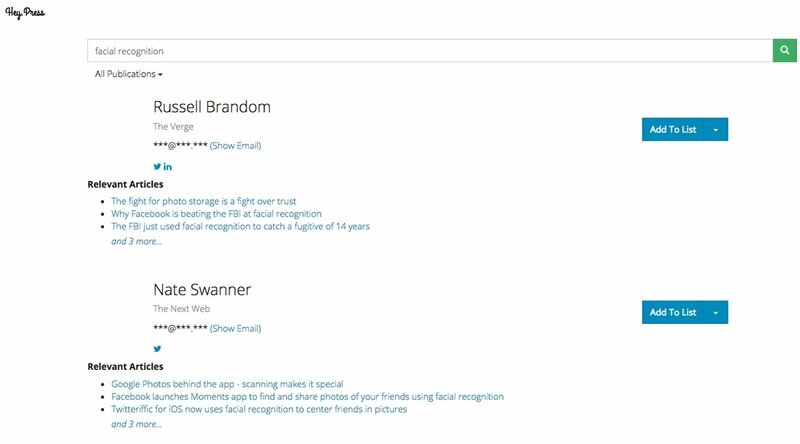 If you input the tech niche you wish to focus on—for instance, “facial recognition”—Hey Press will return a list of journalists who have recently written about that topic. It links to their articles, so you can examine their writing. Hey Press provides journalist contact details for specialist startup publications, local press, and industry niche news. On the free plan, Hey Press lists up to two relevant journalists per search but doesn’t provide contact details. The paid plans provide you with more journalists and their contact details. If you are all in on engaging in influencer marketing, you may opt to run with one of the influencer marketing platforms. There are now quite a few of these specialist platforms, and new ones are popping up all the time as influencer marketing becomes more widespread. The Influencer Marketing Hub (which I founded) has reviewed many influencer marketing platforms. Some of the influencer marketing platforms you might examine are Onalytica, TapInfluence, HYPR, Webfluential, Upfluence, and Julius. The influencer marketing platforms vary in their services, but they offer some combination of influencer search/discovery, influencer relationship management, fee negotiation and payments, campaign management, social listening, audience demographic data, and performance metrics. Their influencer search and discovery role makes them a particularly useful way of finding social media influencers. They usually provide some form of influencer search tool, using a familiar search engine interface but with an algorithm that is searching through highly specific sets of data. An opt-in network. Brands search an influencer marketing platform for suitable influencers from a list of people who have already signed up as being willing to be part of the service. They will have have been vetted by the platform to ensure they meet influencer-criteria. Social scrapers. These search the social space on the Internet to find people who meet influencer criteria on a particular topic. If you find suitable influencers on a platform with opt-in search, you already know that they are willing to work with brands as an influencer. The main problem is that there are far fewer influencers to b found on these search engines. Social scrapers can find many more truly relevant influencers; however, there is no guarantee that these people will be willing to work with you. Influencer marketing is a usually organic, realistic alternative to traditional paid advertising. It avoids any of the problems of ad blockers while at seeming like natural content to millions of social media users. It does rely on the availability of influencers willing to work with you if it doesn’t alienate their audiences. The hard part has always been to find suitable influencers. As influencer marketing develops, that is becoming easier to do, particularly with the rise of influencer marketing platforms and their specialist search engines.